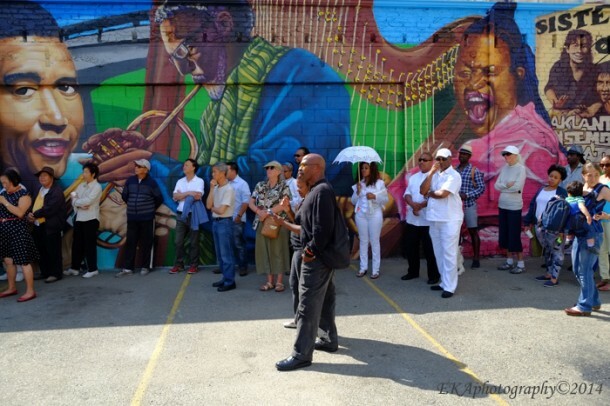 On Friday, August 8, 2014, CRP announced the completion of Phase I of the Alice St. Mural Project with a ribbon-cutting ceremony, held in the parking lot at Alice and 14th St., in front of two sections of the mural wall. 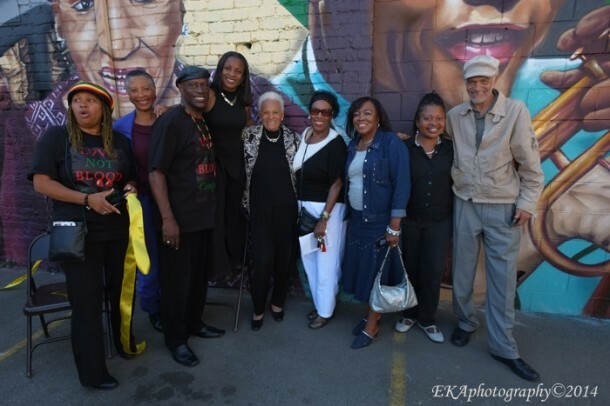 The event, which was noted by the Oakland Tribune, the San Jose Mercury News, and KQED, was an overwhelming success, with over 120 attendees, including approximately 75 residents of the Hotel Oakland, along with neighborhood residents and artists-in-residence at the Malonga Casquelord Center for the Arts. 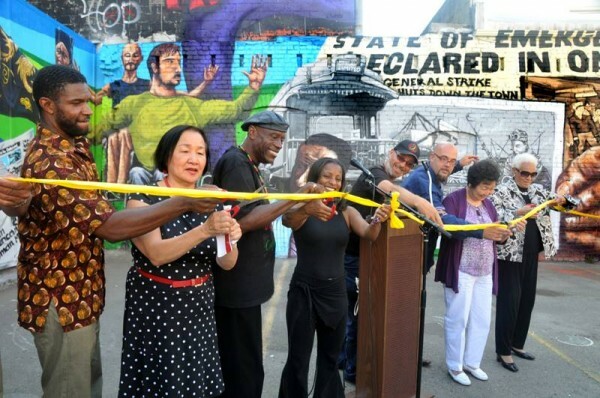 Several people featured on the wall were in attendance, including African American media icon Jerri Lange: musician Destiny Muhammad aka the “harpist from the Hood”: social justice activist , Cephus Johnson, director of the Oscar Grant Foundation; dance teacher Carla Service, founder of Dance-A-Vision; Oakland Chinatown historian Roy Chan, doctor of Chinese Medicine Yin Lin Liang, and dance teacher Lisi You. Oakland Mayor Jean Quan, honored on the wall with a picture of an Oakland Tribune headline celebrating her election as the nation’s first Chinese-American female mayor of a major city, was also on hand, as was Victor Luo, who translated remarks from English to Cantonese and vice-versa. Some of the most poignant remarks were made by Lange, who was introduced by her son, Michael. 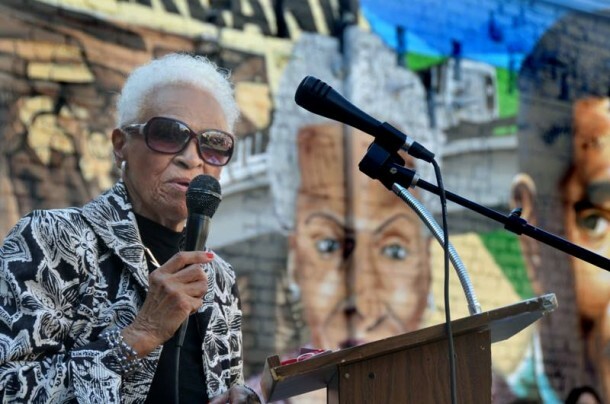 The former broadcaster said “I’m very comfortable with this mural, because this is the way West Oakland looked when I was born there.” She recounted how she grew up in a diverse community of “Japanese, Chinese, Irish… all the different [ethnicities] that exist in this world.” The mural’s diversity, she noted, “ is the closest I’ve seen to returning to that kind of feeling about Oakland. “This is what America is about. And America is now coming to the realization that this is who we are,” she exclaimed. 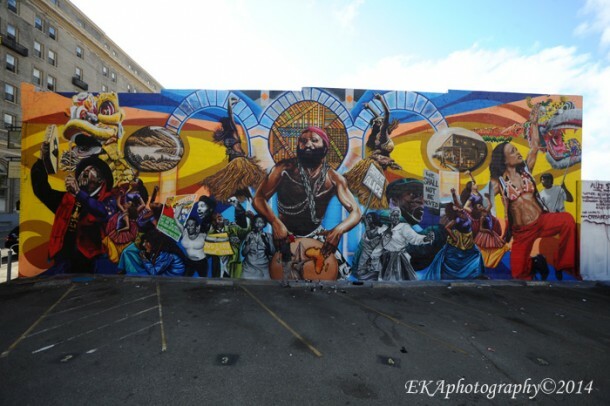 Mayor Quan said she was happy to see new murals go up in Oakland, noting that public art took a hit from the elimination of the redevelopment agency in 2012. 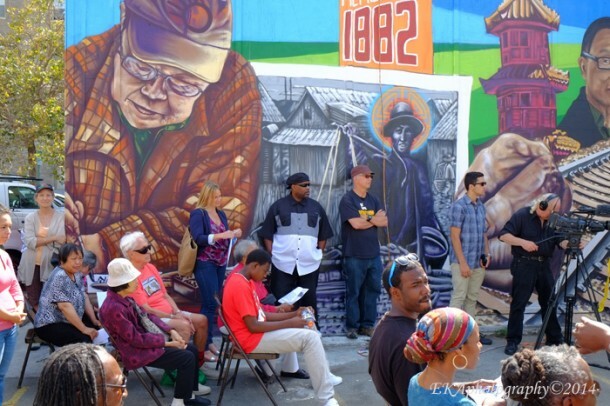 The mural, she revealed, spoke strongly to her own history, as a fourth-generation Oaklander—her great-grandfather came to Oakland following the 1906 Earthquake—founder of the Asian American Studies program at UC Berkeley, longtime political activist, Oakland’s first Asian School board member, City Council person, and finally, mayor. 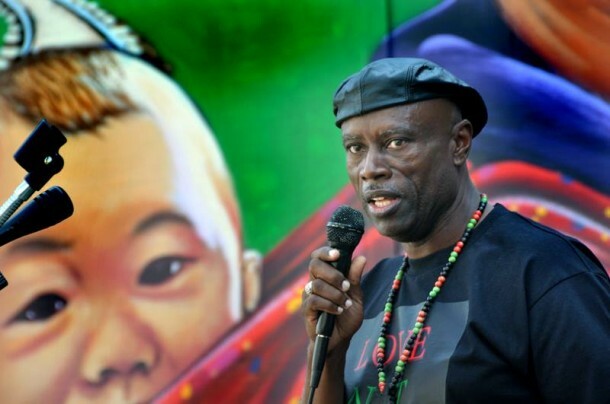 Quan went on to talk about the historical displacement of Chinese Americans (“Because they weren’t wanted, didn’t have a lot of political power downtown and other people wanted their land”). She pointed to a painting of a 19th century Chinese produce-seller carrying a pole holding a basket. “Even that pole, because the Chinese were so good at growing vegetables, they outlawed that pole so that they couldn’t bring their vegetables over to San Francisco,” she said. 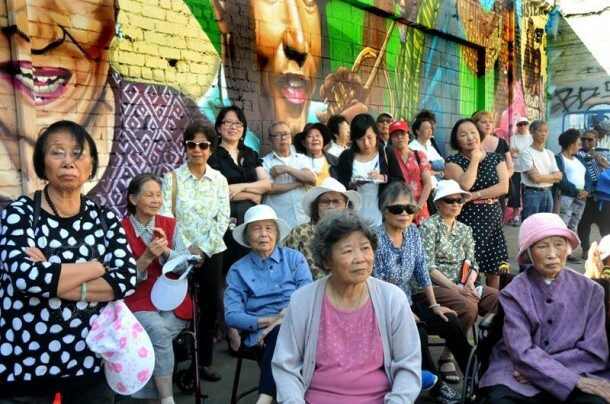 What Quan didn’t say, however, was that in 1911, two Chinese-American women and Oakland residents, Emma Leung and Clara Lee, became the first Asian-American female registered voters in the country, after filing their paperwork at the Alameda County Courthouse – located just a few blocks from the mural site.